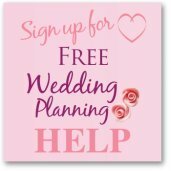 Western wedding decorations make your cowboy themed wedding extra special, here are lots of ideas to help you decorate the wedding of your dreams. Yehaaa! So you have finally roped yourself a cowboy and now you want to tie the knot in a theme that would be the pride of the wild wild west. You might have already thought of appropriate wedding attire for you, cowboy-hubby-to-be and the rest of the wedding entourage. 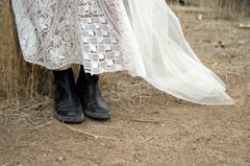 Here's hoping you will wear an authentic cowgirl fancy wedding boots under all that lace when the music starts. 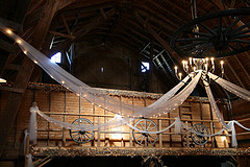 Instead of using bolts of tulle and lace for the pews, consider thick ropes for "looping" on pews. Tie some silk wildflowers with raffia then attach on the pews. You might have to use a pew clip for the rope and wildflower bouquet. Roll out an aisle runner then scatter flowers on the runner. You can get pots of forget-me-nots (for blue motif) or dandelions (for yellow motif) or blue violets (purple motif) or pink gerbera (pink motif) to line up the aisle on both sides. You even have the option to use these pots of flowers for the reception. Instead of using traditional flowers for the altar and the entourage's bouquets you can opt to use wild flowers like dandelions, buttercup, lilac, morning glory, dogwood, daisies, orange blossoms and the likes. Use lots of fern and tie the bouquet with raffia and ribbons. If the wedding is set in a garden then you can add bales of hay and wagon wheels here and there. Line the aisle up with gas lantern just like the one used in old cowboy movies. Make sure though that someone is assigned to look after the gas lanterns to avoid accidents. You could use an arch or lattice decorated with ivy and fairy lights. Use wild flowers too for accents. How apt it would be if you could set the reception in a barn. 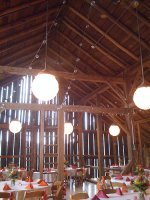 However since a real working barn is not that easy to find, you can just turn the wedding reception hall into a real western inspiration. Get those bales of hay and wagon wheels! You can use the bales of hay as extra seats when it's dancing time. Cover the bales with colorful quilts or blankets if they are to be used as seats. Decorate the ceiling with lengths of ribbons starting from the center of the room to the walls. Put up lassos and ropes on the wall. Hang some wonderfully-made Navajo blankets on the wall. Cover the tables with white linens for a base then put gingham runners on them. You can also use faux leather for table runner. For the table centerpiece, you can use the potted flowers used for the aisle decoration. 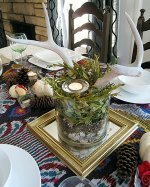 Another easy and inexpensive idea is to set a potted cactus on the table, surround it with votive candles tied then accent the arrangement with sprigs of dried stems and grass. 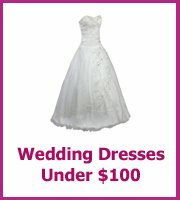 Buy some tin buckets and have them spray painted in the wedding's color motif. Fill the bucket with a bunch of wildflowers - dandelions, spider lilies, dagwood, zinnia, pansy and whatever wildflowers you can source locally. Add a lot of babys' breath for height and some fern leaves for green and you have a wonderful , inexpensive and western inspired table centerpiece.